PALLADIO RV2 is one of the elegant textures composing the interior wall panels line called PIETRE INCISE PALLADIO, which is inspired by this great Renaissance Architect and his artistic lines and shapes, but which has also a strong contemporary mood, that was interpreted by stylist Alessandra Orzali for the new catalog dedicated to the PASS collection by MOLTENI&C. 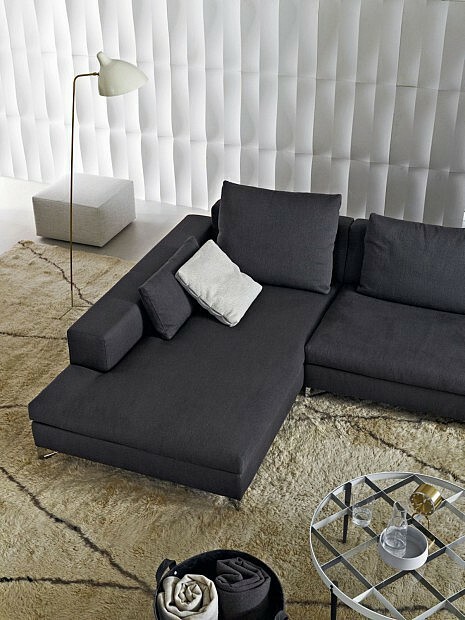 The stylist studied a setting which is simply sophisticated, where the new modular PASS elements by and the interior accessories have a refined and essential personality that merges with the three-dimensional and decorative character of the PALLADIO RV2 wall panel in ‘bianco cotone’ limestone. The dramatic light-and-shadow effects created on the stone surface by the experienced processing become delicate shades of grey on this snow-white natural stone, selected from Lithos Design materials range; as a result, the wall matches the contrasting colours of the suspended storage units in a skilled, stylish way. An interesting application of this texture, then, revealing the inner soul of the whole PIETRE INCISE PALLADIO collection, just the way designer Raffaello Galiotto had first imagined and then designed it: with the goal of elaborating without uprooting the essence of the classic appeal and its fundamental traits, working with surfaces, lights and shadows, and revamping the classic style with a contemporary approach.